Zebras are uniquely beautiful swallowtail butterflies. They are native to the southeast. 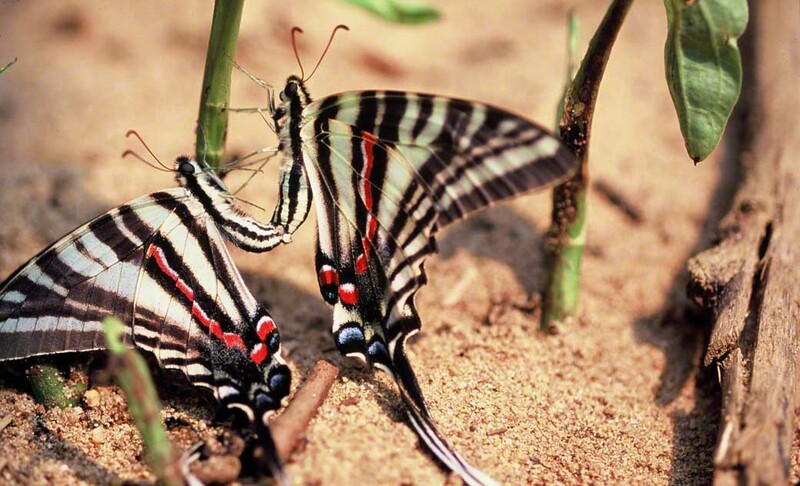 This pair was on a sandy beach at Mason Neck State Park in Virginia. Both showed vibrant color and were in excellent condition. Reds, blues, black, yellow to whitish-yellow. Oooh. They remained there for quite a long time. I got down on the sand with them and shot at least 60 exposures. I’m pleased with this one. Eurytides marcellus‘s range extends from western New York south to Florida. Truth be told I’ve yet to see one in western Pennsylvania.